Remember, O most gracious Virgin Mary, that never was it known that anyone who fled to thy protection, implored thy help, or sought thy intercession, was left unaided. Inspired with this confidence, I fly unto thee, O Virgin of virgins, my Mother. To thee I come; before thee I stand, sinful and sorrowful. 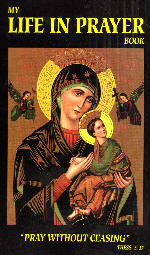 O Mother of the World Incarnate, despise not my petitions, but in thy clemency hear and answer me. Amen. Mary, Mother of God and Mother of mercy, pray for us and for the departed.